I don’t want to pretend for a second that we regret moving to Oregon. It has been an unbelievably great decision. Our health has improved. We are more active. We wake up most days to beautiful fall leaves and mountain fog. The culture is very live-and-let-live and we love it here. BUT…there’s always a but, isn’t there? We are lonely. As friendly as everyone is, we don’t really have any friends yet. Sure, we know lots of people. Friendly people. People that are happy to greet us at work and ask us what we did last weekend. People who say hello at the apartment mailboxes. People we wave at everyday that also bicycle commute. The fact that we didn’t have any friends yet hit us recently when we traveled out of town for a friend’s wedding. We needed a dog sitter and realized we didn’t know anyone well enough (or even have their phone number) to ask them to dog sit for us. Then there was getting a ride to the airport. Who do we ask? Collecting our mail while we were out of town? Who? We really are alone up here. Lately we’ve been trying to make plans for Halloween. It falls on a Saturday this year and we are both off of work that evening. We’ve both been dropping hints every chance we get that we have no plans and we’d love to join in on whatever it is that people do up here to celebrate. The hints have all bombed. Apparently tons of people are throwing parties…that we are not invited to. Then there’s the holidays. Since we’re both new to our jobs, we both work and don’t have enough time off to fly home and visit our families. So, like two little smelly orphans (this is not to suggest orphans smell, only that we must stink since no one wants us around) we will be spending the holidays alone up here. Sometimes we feel like strangers in a strange land. 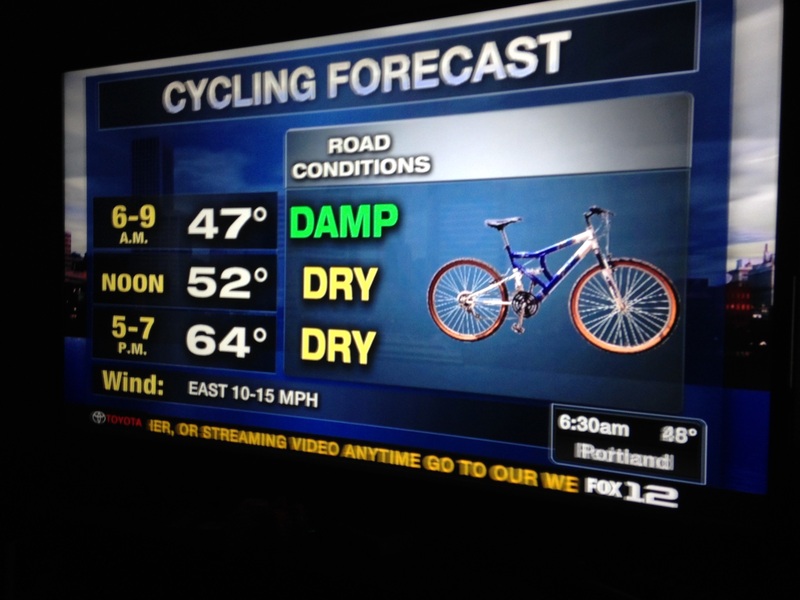 The weather reports on the news offer an “outfitters guide” and a bicycle forecast. No. Seriously. I took a picture because I knew the folks back home would never believe me. Sometimes we have no idea how to react in conversations (“you have to drive out to the Dalles tonight…..wow??? Is that far then?”) Then there’s the home buying process. So far we’ve been turned down by three realtors. Apparently no one wants to work with you if you are trying to buy property, no matter how small for anything less than $200k. The folks at work tell me they have missed out on houses because they didn’t bid $100k above the listing price. So, as glad as we are to be here, sometimes it hits us hard that we are two thirty-somethings stuck in a crappy, little apartment with no one to hang out with but each other. It’s a dramatic change from just six months ago when we had a large house with a large yard for the dogs, family just an hour away, and more friends than we knew what to do with. To compound that lonely what-do-we-do-all-by-ourselves-this-weekend feeling, everything in our place is unfamiliar. We sold everything in the move. Everything. Now the bed we lie down on is unfamiliar. The couch I am blogging from is new. The vacuum I’m charging is new. Nothing is a friendly reminder of the life we had just a few short months ago. Me: ok, I’ve almost worked up the courage to ask one of the guys I work with out to dinner. He’s pretty cool and his wife sounds like an interesting lady. I think they might be a good couple to double date. My husband: ya, I’ve been working on this new guy that is helping out at our office. His haircut and tie selection convinces me we could be compatible. He transfers back to his regular office next week, but I think I could close the deal by Friday. No. People don’t just say that to each other. But, oh! If only they did! This would all be much simpler. Perhaps we’re radiating desperation and potential friends are being driven away by it? I’m not exactly wearing shirts proclaiming “Seeking friendship within ten mile radius of greater Portland” but at this point, I’m not above it. So, in summation, we’re happy to be here; we can’t find affordable housing; we’re currently accepting friendship…any friendship….really….anyone…you don’t even have to be originally from Earth…we’ve broadened our search criteria to interstellar…and we’re just a tad lonely in a beautiful, but strange new place, surrounded by what appears to be someone else’s stuff. I can say with every certainty now, a good instructor makes all the difference. 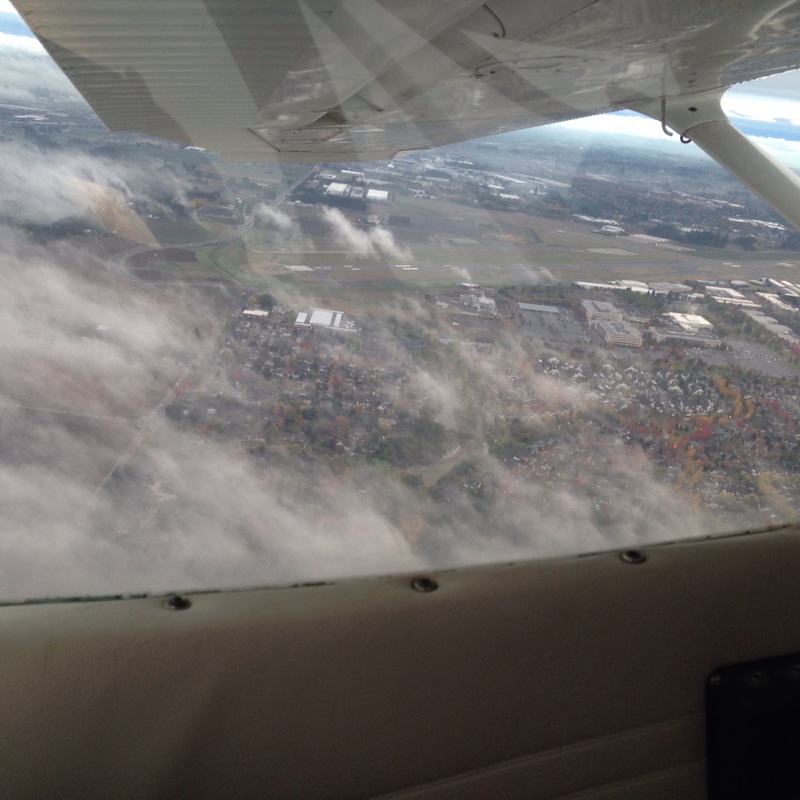 Yesterday while the rain poured down across greater Portland I met with my new CFI for a ground school lesson. It took all of my gumption to drive up to the airport and give it another go, but I left in better spirits. It was a lesson on airplane systems. Instead of point to pictures in a book and talk shop somewhere ten feet above my head, we headed down to a hangar where mechanics had planes pulled apart for maintenance. I got to understand the design of a propeller (chomping down and slicing up) by watching my instructor spin one slowly in front of me. I saw a carburetor in pieces. I spun a gyroscope in my hand. 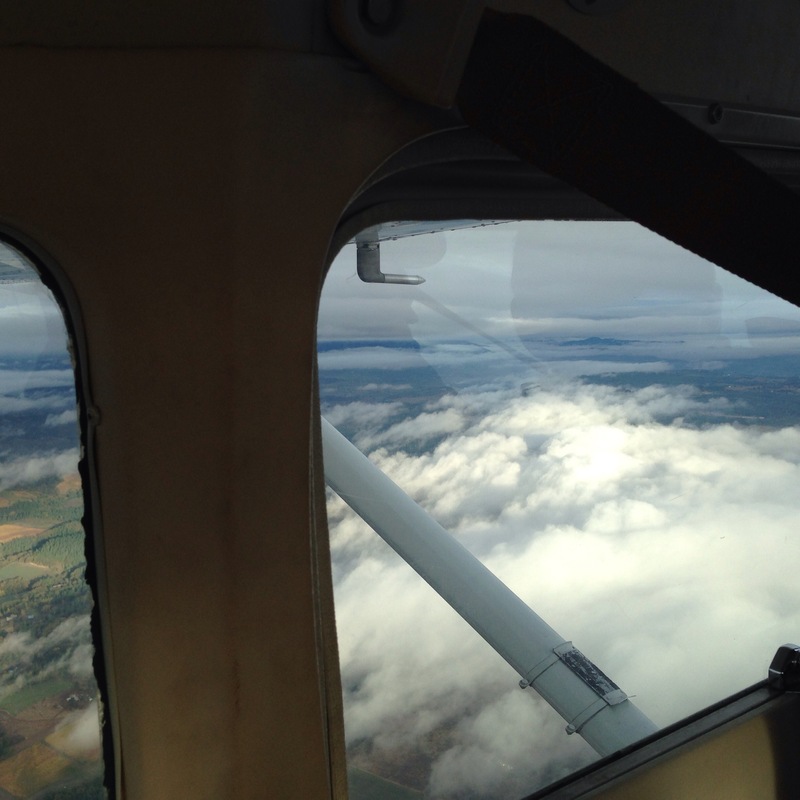 I got to see some of the subtle differences between a Cessna 152 and 172 and a Piper Seminole. I got to see with the cowling pulled off where many of the wires that normally disappear mysteriously under the hood connect. This morning I awoke to more gray skies and light drizzle. Surely my flight lesson would be cancelled. Nope. According to my new instructor, you can’t learn to fly in bad weather unless you get up there and do it. And so, up we went. I learned the principles of slow flight and then we headed back to the airport to do touch and goes. 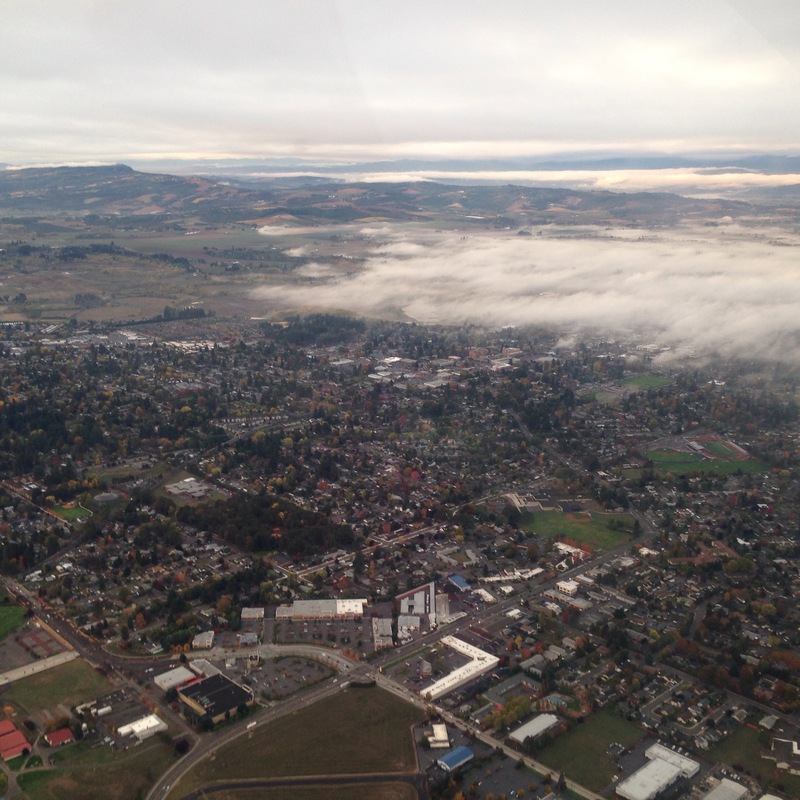 It’s a new world flying in Portland. For starters, there are mountains and volcanoes. Big ones. Then there’s the trees. 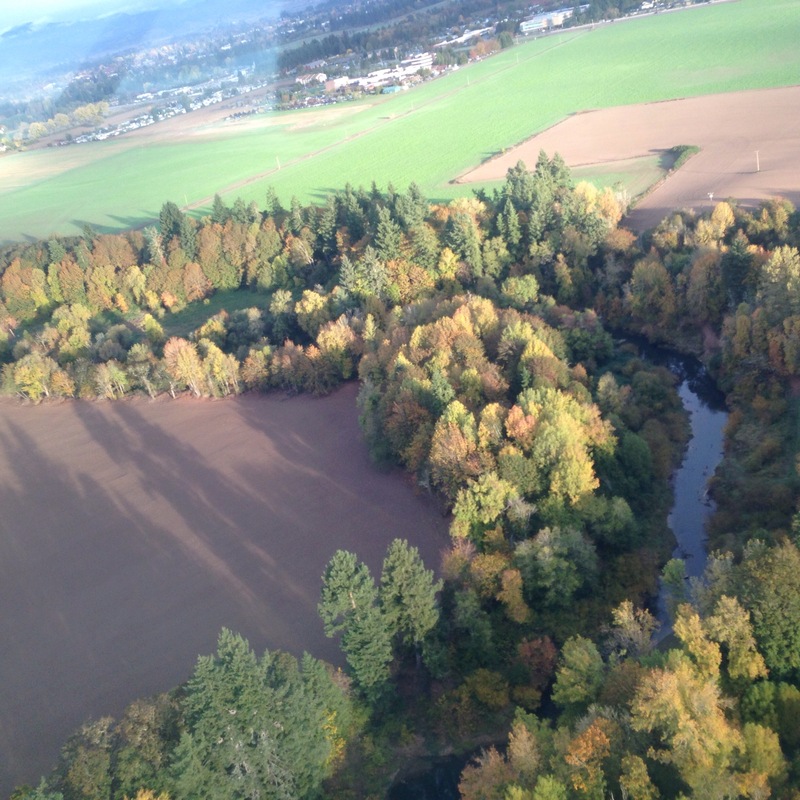 So many really, really tall trees all the way up to the runway. And then there’s the airport itself. In Texas I flew from a privately-owned, non-towered, GA only airport. My new airport not only runs one of the busiest flight schools in the region for fixed wing and rotorcraft (everything up to ATP), the likes of Nike and Intel hangar their their jets there and there is an active FBO for general aviation. Practicing touch and goes today was like learning an obstacle course. In the pattern there were helicopters hovering at 1,000 feet, jets coming in from the east, students coming in from the West practice area, both patterns (left and right) had traffic and each time around you had to get in line to land on one of three parallel runways simultaneously with other incoming traffic. 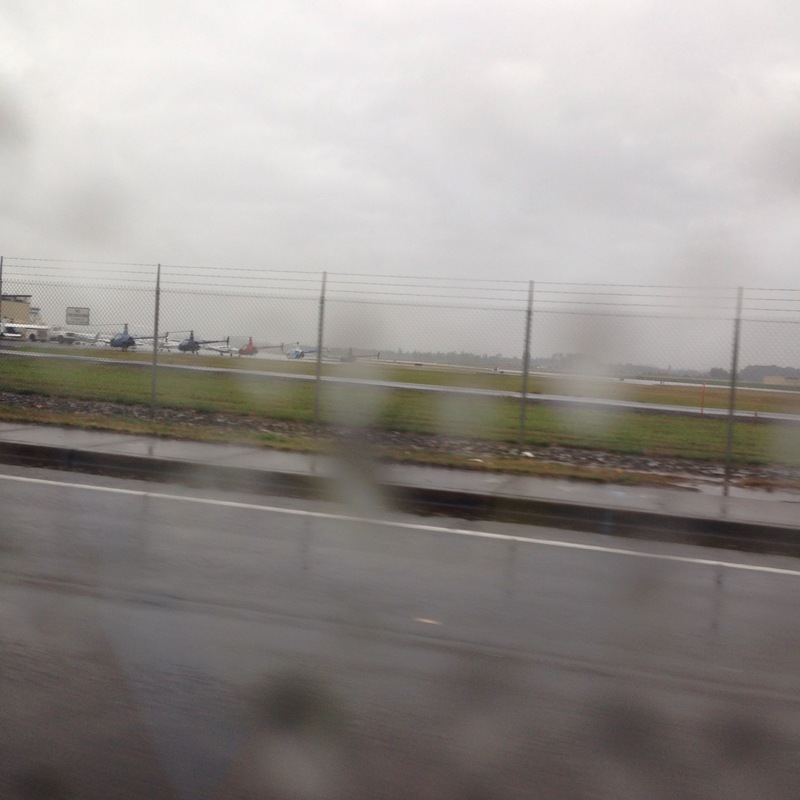 That is not to mention the flocks of birds that were migrating across the runways. It was thrilling! A new instructor made all the difference. Before I was ready to quit and everything flying-related made me want to burst into tears of frustration. Now, just like that [insert snap here] flying is fun again. My next lesson is Wednesday. I can’t wait to get back up there!!!! My CFI and I talked and despite my request to have more control of the plane she explained that in a few more lessons we would be introducing the elements we talked about (taking off, using the radio, and taxiing) but landings would not be introduced until somewhere between lesson 6-10. We are currently STILL on lesson 3. She was unbelievably cool about it. She completely understood and even gave me the names and contact info for some other CFIs she thought would match my learning style better. She recalled having an instructor she didn’t mesh well with during her private and took no hard feelings from my decision. I began making calls to these other CFIs. I also made a call to the admissions office to see if they could give me some more contacts, specifically asking for CFIs that were go-to folks for information and were known for taking on struggling students. Instead of help from the admissions office, I have received a stream of random phone calls from people saying “hi, my name is _____ and I’m your new CFI.” I interviewed the first one and found he was new, I would be his first student, and he had the confidence of a turtle on a fence post. In more polite words I told him like hell he would be my new CFI but thanks for the call. Meanwhile I interviewed one of the CFIs my previous instructor recommended and was very impressed. He offered to let me sit in on an IFR lesson with one of his students and I loved his laid back flying-should-be-fun attitude. It was an international student that struggled with English more than aviation and the CFI never lost his temper, never seemed annoyed and kept everything on track the whole lesson. He also gave me contact info for another student of his as a reference. After a glowing recommendation from this student (that had coincidentally also started out with the first CFI I had just fired) he was clearly the front-runner. He had a history of taking on struggling students and an average of soloing them somewhere between 20-30 hours. I called admissions to ask for the procedure to switch to this other CFI. When I gave his name you could hear a clear switch in demeanor. Instead of getting information I was being interrogated. Did he approach me? How did we find each other?I sat in on a flight with him?! Preposterous!!!! By the end of it I was certain I had somehow gotten him in trouble. I was told I needed to meet with the chief flight instructor about all of this and that I probably wouldn’t get him as my new flight instructor because his schedule was full. I’m a problem student?! That’s the label I’ve gotten myself for trying to be an educated and proactive consumer? Without mentioning any names, I said I had already selected a CFI and I wasn’t sure why I was getting the run-around from admissions. The fellow on the phone had already been briefed, knew exactly who I had asked for and said his schedule was full and as a flight school they want to make sure all of their CFIs are getting a good load of students. I explained to him this CFI that I wanted had already discussed availability with me and we are both wide open 9-11am most days. To placate him I agreed to call this other “problem student” instructor but I would be interviewing him, sitting in on a flight lesson and requiring a student recommendation before making a decision. He said that would be fine, apologized for all of the trouble, and asked me to call him back after I spoke with the “problem student” instructor. I have left a message with the newly recommended instructor and am waiting to hear back. Now I am split 50/50. If this “problem student” instructor is good and I am happy with him, I’ll just go with him. It would make things easier. But the other half of me is furious. I’m already labeled a problem so why not get what I want? I’ve done all of the leg work and it’s not my problem a flight school wants to be sure all of their bad instructors have as many students as their good instructors. Thanks to all of the fantastic pilots that have commented on my blog and helped steer me in the right direction. I’ll keep you guys posted, and would love to hear what you make of all this. 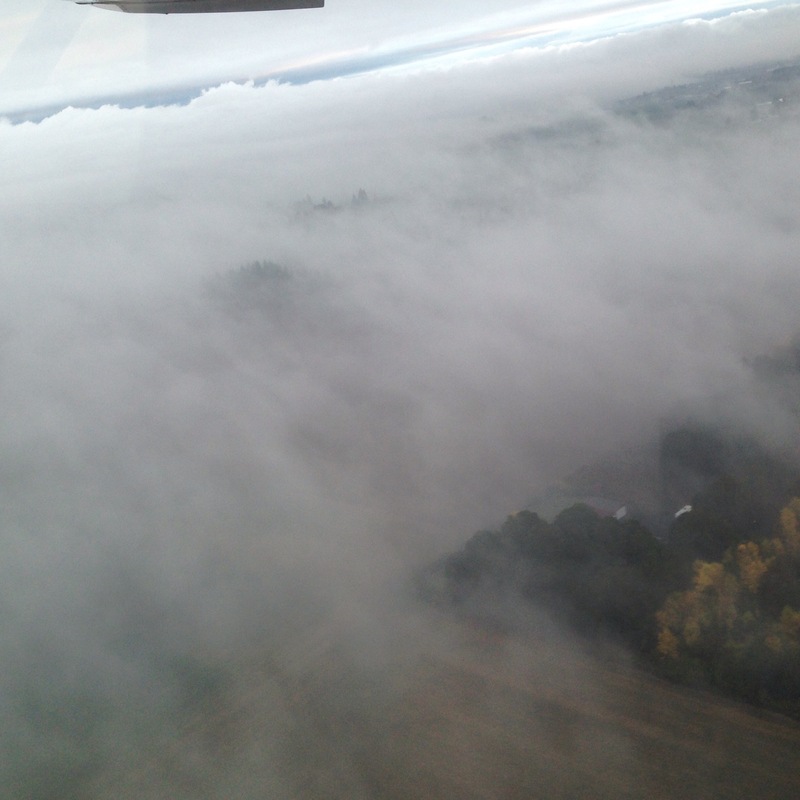 Below are pictures I took from the IFR flight I sat in on….my first IFR flight in a cockpit ever! Well, folks, I can’t seem to win at this flying thing. 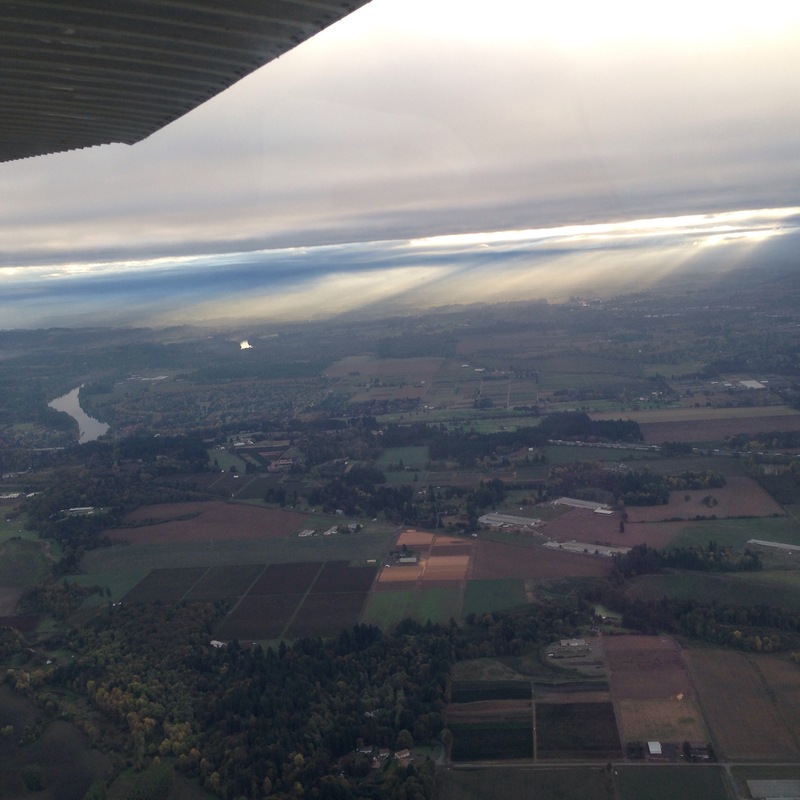 I enrolled at an aviation school, got a flight instructor and began again. Now I’m a few more lessons in, a few hundred more dollars spent, and have somehow managed to go backwards. As my mentor helped me to understand, my instructor is afraid to let go of the plane and its costing me time and money. I am at about 10 flight hours now and I have an instructor that won’t let me taxi, takeoff, land or get on the radio for even a second. It’s pretty frustrating considering with other pilots and other instructors I have done all of these things before. Our lessons are simple, she takes me up, I put on foggles and do very basic maneuvers or simply go up and down, left and right without foggles, and then she lands the plane, taxis it back to a parking spot and the lesson is over. I thought I was getting somewhere because I have begun filling out the flight manifest and doing the preflight by myself. It has been brought to my attention I am mistaken. At this rate I’ll never solo. Our next ground lesson is on the four forces of flight. Oh goody. The one after that is on aircraft systems. I am bored out of my mind and have already done all of these lessons before on my own time. When I enrolled I was told my five logged flight hours and other not-so-logged flight hours would be taken into consideration. In reality, I’m barely flying the plane during any of my lessons and I’m paying dearly at a fancy flight school to review ground lessons I already know. How do I feel about flying these days? Frustrated. Bored. Depressed. Angry. Ready to give up and quit. It doesn’t help that it’s so ridiculously expensive. I feel like I am throwing hundred dollar bills in the trash. And I feel incredibly guilty because this is money that could be going to other ambitions my husband and I have. We work so hard lately and barely see each other. We’re trying to save up for a house and to send my husband back to school. Every time I shell out hundreds of dollars for one lesson and don’t actually learn anything new I feel like I’m failing my family. I feel like I am letting a bad instructor take advantage of us. I ask lots of questions and I study everything she tells me to but I still feel like I’m spinning my wheels and the guilt of how much I’m spending to get nowhere is crushing. It keeps me up at night. Exibit A: It’s after midnight now and instead of sleeping, I’m writing this post. My flight instructor hasn’t been on time to one of our lessons. She chats with other pilots passing by in the hall during time I’m being charged for ground school. I’m hearing a lot of “we’ll get to that later” when I ask questions. Frankly, I’d like to fire her. But on the other side of that coin is the realization that the aviation world is small, the female aviation world is smaller and I’m really not sure I want to piss off one of the few allies I have in a town I just moved to. My mentor and I talked it over and came to a decision. I’m going to talk to my CFI and explain that I am disappointed with my progress so far and starting with our next lesson I will be in control of the plane the whole flight unless there is a life threatening situation where she needs to take it from me. If she agrees, I’ll give her another shot. If not, I’m switching instructors. Again. More than anything I am brokenhearted. I wanted so badly for this plan to work out better. So far it doesn’t seem to be working out at all….except for my instructor, who is banking.